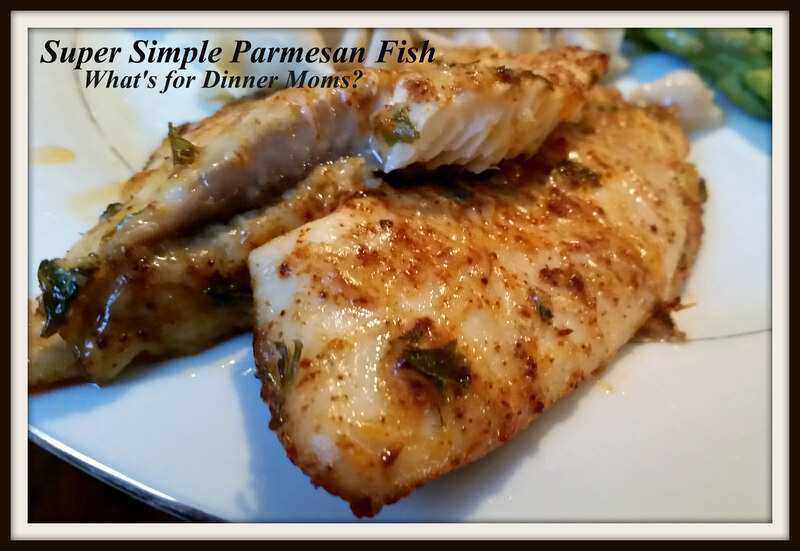 Super Simple Parmesan Fish – What's for Dinner Moms? We finally arrived home yesterday. It certainly has been a crazy month! First our trip to Walt Disney World then home for four days and then to visit my parents in North Carolina. We arrived home for about 20 minutes and then I had to drop her off at work. I needed to get a seam ripper so we headed to JoAnn’s. When we were done we happened to drive by the carpet store that I have wanted to go to for the last six months. Of course I had to stop. I hadn’t even gotten the car unpacked and we bought a 12 x 12 rug to go in our living room and a 7’6″ rug for my daughter’s room. Of course they don’t fit in the minivan so we move all the suitcases to the center of the car and drove with the trunk open for the four mile drive home. Dropped the rug off and picked up my son to go to a choir rehearsal. Oh, we need to go pick up the cake we ordered to honor April birthdays at choir. To the grocery store pick up broccoli, deli chicken, and the cake. Got to think about dinner! Dropped the cake off at the church and head to Buffalo Wild Wings for a short date while both kids were busy. We took the leftovers home for the kids. I ran to pick up our daughter while my partner went the opposite direction to pick up our son. Drove downtown for a bit looking at all the couples taking pictures for prom. Then to drop off two books at a friend’s house. Home, finally at 6:00 pm, to make dinner. Yes, I still needed to figure out dinner. 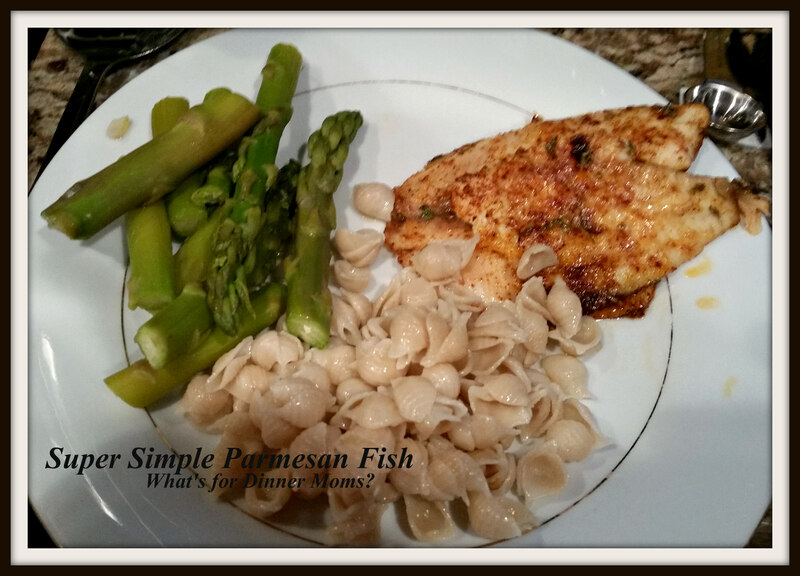 Super simple Parmesan fish (you can use your favorite fish for this dish – mahi mahi, white fish, tilapia, etc) because we had some fish on hand in the freezer and a block of Parmesan cheese. No need for bread crumbs or heavy white sauces for this dish. Easy, on hand ingredients for a dinner ready in about 20 minutes. Both kids loved this dish! They both thought it was flavorful and light. They both asked for seconds almost as soon as they took the first bit of their first serving. That is unheard of in our house. We served this with steamed asparagus and pasta with butter and garlic. This meal was easy to make gluten-free for my mostly gluten-free son by making him a separate pot of gluten-free pasta. On a plate mix together the cheese, paprika, and parsley. Drizzle the fish with olive oil and then dredge in the cheese mixture. Pat the mixture onto the fish to help it stick. Place fish on baking sheet and bake 10-12 minutes until the thickest part of the fish is cooked through. Remove fish from oven and serve. Ooooh. Yum. I just saw a 2 lb. tilapia , boneless, skinless, in our freezer.. This recipe is very easy and simple to make. Thanks ! Hope you like it. The kids loved it. It is super light and easy! What a whirlwind day! The fish looks excellent! Thank you so very much! BTW Congratulations on your food truck! How cool! Always on the look out for easy week day suppers. This is perfect! Thanks for the samre. Thank you! That is exactly what I try to do. Mostly simple meals that can be made ahead or quickly on busy nights. Ok tell me when its fish nights that looks amazing..ill be right over lol and your dancing daughters adorable love the spirit..